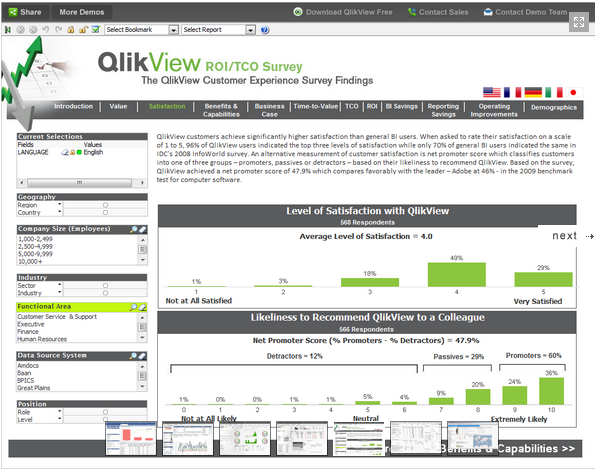 QlikView is the most flexible Business Intelligence suite that supports turning data into knowledge. Business can easily enable their users to search and analyze the data visually for exceptional business insights using QlikView and this bag QlikView with 24,000 organizations globally. 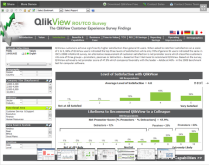 QlikView encourages unimpeded analysis of application data, assist the users in time saving and taking accurate decisions. 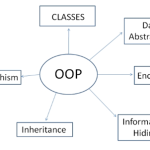 Effectual decision making is based on the right information provided and with easy accessibility. 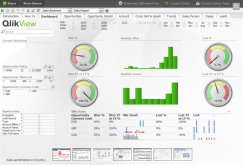 BigClasses helps the new domain lovers to learn Qlikview in a very effective manner through QlikView online training. 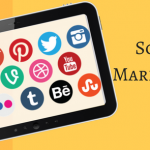 Linked In Contacts Analyzer: One of the largest professional networking website LinkedIn, analyzes the data as an integral part of Social Media Analytics. 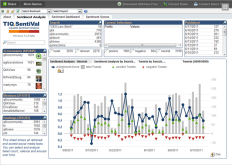 Twitter Sentiment Analysis: Twitter also is one of the valued users of QlikView, Twitter Sentiment Analysis keeps track on a person’s status, posts, tweets, messages and comments. 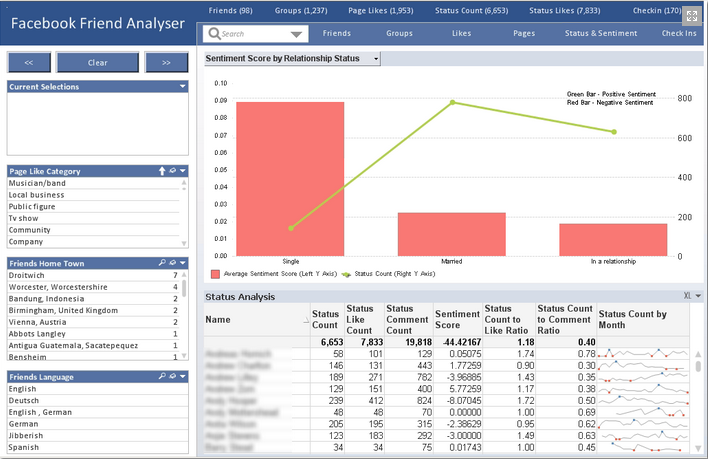 Facebook Friends Analyzer: Facebook has a great dashboard that analyzes our friends in many ways like Groups, Likes, Check in’s and also cross segment the data as Gender, Relationship status and in many more. 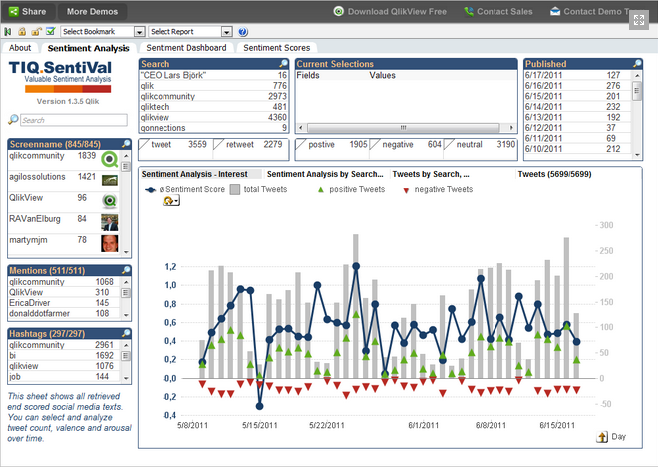 Facebook also got a unique dashboard by using Qlikview with many techniques such as Social Media Measurement, Integrating with Google Maps, Geocoding, and Sentiment Analysis. Salesforce CRM Dashboard: Salesforce uses QlikView in loading and analyzing the CRM data. It is a cloud based platform, able to start instantly at hands on just by installing a QlikView-Salesforce connector. 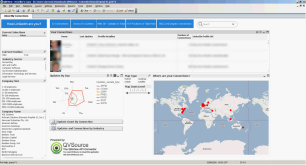 IDC Survey: IDC survey dashboard, where the data combines in dashboard with qualitative and quantitative data achieves a new range of analytical possibilities. 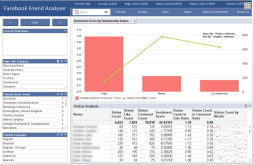 User can Manage, Monitor and Measure the business using the dashboard to monitor over the data for a great business impact. 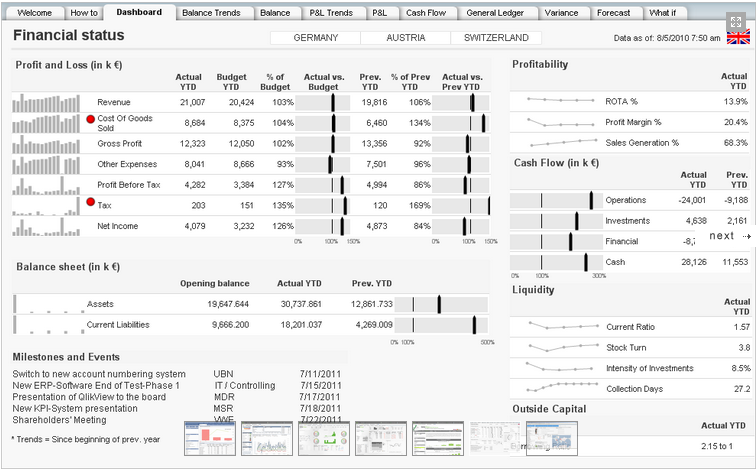 Financial Controller Dashboard: Financial Controller has a great designed dashboard with KPI’s and data. 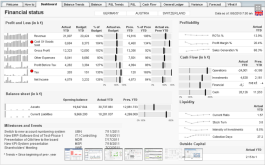 It clearly shows Profit and Loss overview with detailed scenarios on Gross Profit, Revenue, Cost of Goods and many more.